The year is 1814. Napoleon has been exiled to Elba, and Major Lord Will Masterson is weary of war and ready to return to England and the life he left there. But the army has one more task for him first. Colonel Duval, an intelligence officer whom Will met five years earlier when they and three others barely escaped before being executed by the French, asks Will to accompany a small, advance group of soldiers who are returning to their home, San Gabriel. The tiny country, located between Spain and Portugal, proved a staunch ally during the war, but news has been sketchy since a marauding French officer attacked the country and captured the monarch and his heir. England wants information, and the authorities believe Will is the man to provide it. Will arrives to be met by a tall, pistol-packing Englishwoman, Lady Athena Markham. Athena is companion and advisor to Princess Sofia, who will become San Gabriel’s ruler once she comes of age. Independent and unconventional, Athena is unlike any other woman Will has known. As the two work together first to help rebuild war-ravaged San Gabriel and later to stand with the San Gabrielites when their enemy, undeterred by the end of the war, returns, a genuine friendship develops between the two. Underlying the friendship is an attraction that proves irresistible and a love strong enough to conquer all obstacles. And the obstacles are also genuine. Will finds Athena beautiful and fascinating, but she, the illegitimate daughter of a legendary courtesan and an aristocrat, is not interested in following her mother’s example or in becoming the wife that will plunge Will into scandal. 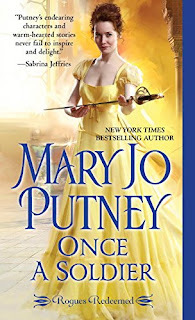 Once a Soldier is the first book in Putney’s new Rogues Redeemed series, and it is definitely another MJP winner. The portrait Putney paints of San Gabriel and the courage and tenacity of its people in enduring the costs war exacts and in struggling to rebuild and reclaim their lives is powerful. Athena is a heroine who lives up to her name without losing her humanity. She is ferocious in war, wise in counsel, and believably flawed. I particularly liked the relationship she and her mother shared for the first fourteen years of Athena’s life. Delilah was not another scheming courtesan parent who used and abused her daughter. 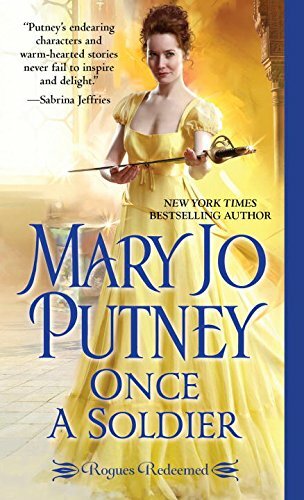 Putney is known for her skillful blending of romance and adventure, and she does it again here. Some readers may find the viniculture bits slow the pace, but others will enjoy the details, as I did. I would also argue that the adventure doesn’t end when the leads leave San Gabriel. One of the novel’s great strengths is the development of the relationship between Will and Athena, one that grows from initial meeting until the HEA. The book hooked me on the series, another mark of its success. I love the redemption theme, and I am intrigued by the four remaining rogues. I’m especially excited that Gordon, another Westerfield Academy alumnus and a mysterious secondary character in Not Quite a Wife (Lost Lords #7) is one of these rogues. Perhaps his story will be next or perhaps the next hero will be half-French, half-English Duval. Whoever the next hero is, I eagerly await his story. Another author that I enjoy - thanks! Love the cover on this! Thanks for the review! I will check it out!